Looks like an exciting day at the beach, however at this point in time, the beaches were still privately owned and you had to pay to enter or most were guests at the many fancy hotels, like the Manhattan Beach Hotel, Balmers Baths, and the Seabeach Palace, etc. 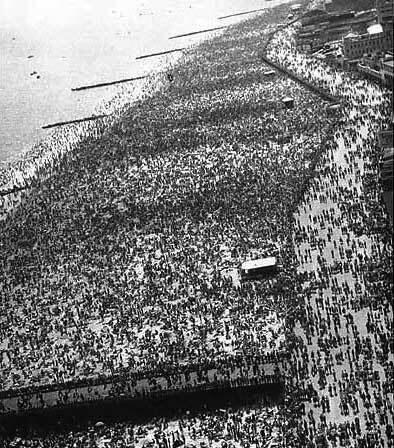 Here's a picture of Crowds on Beach and Boardwalk at Old Coney Island NY 1930s during the Great Depression. 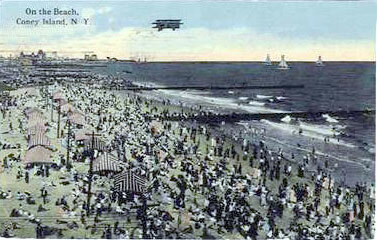 One of the things that dramatically changed Coney Island was the opening up the beach to the public in 1923. Prior to that nearly all of the beach was privately owned and guarded by barbed wire fences extending deep in the breakers. Another thing that caused people to flock to Coney Island was the opening of the Subway with nickel fares. Now it was affordable to everyone to enjoy a day in the sun. 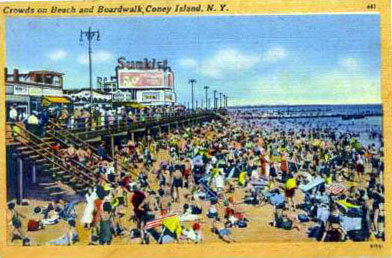 Coney Island, NY 1950�s 1,300,000 Bathers obscure Coney Island Sands - Hot weather worries melt like ice. Subways, automobiles, and excursion steamers, take 70 million pleasure seekers annually to New York�s playground by the sea. Stretching along 3 miles of boardwalk, the resort offers 900 amusements.